Guide to using CALM. - CALM. Follow the Video to get started! It’s best to watch the video in full screen. Get the Instruction manuals here. A: The Electrocardiograph (ECG) Waveform is the electrical signal from your heart. B: The record button will allow you to record and save an exercise session to the cloud for later viewing. The button will turn in to the stop button after recording has started. C: Zoom allows you to view the ECG waveform in full screen. To go back, double tap the screen on iOS, or press the back button on Android. D: Heart rate is the number of times your heart beats every minute. It is calculated from the ECG Signal by detecting the peaks. Strong movements may produce noise which causes error in the calculation. E: The HR Zone warning will be yellow when you are close to the upper limit of the maximum zone. Exercising in the maximum zone helps very fit athletes increase maximum speed, but prolonged exercise (more than ~5 minutes) in this zone may strain your heart. You should never push beyond the maximum zone. F: The CALMness warning will be yellow when your CALMness score is too low, meaning your body is not rested and ready. It is best to check this before exercise, or during warm up, as this indicator is less accurate during exercise. G: The HR Rhythm warning will be yellow when an irregular beat is detected. The detector can sometimes mistake movement noise for irregular beats, so be sure to check the ECG waveform to determine what it is. H: The heart rate graph shows which heart rate zone you are in, to help guide your exercise. I: The CALMness score is the state of your autonomous nervous system, calculated using the heart rhythm. A score of 100 is equivalent to a Yoga master meditating, and a score of less than 20 is equivalent to after pulling an all-nighter before the final exam. More information is available here. J: Motion intensity is how vigorously you are moving (which is different from how fast). It will read 1.0 when you are at rest. If the motion intensity is high, the ECG reading will have noise and may not be accurate. B: This Maximum Heart Rate is the highest heart rate recorded during this session, which may be different from the Maximum Heart Rate capable by your heart. C: This shows the time spent in each heart rate zone. The heart rate zones are calculated as a percentage of your Maximum Heart Rate capacity (estimated from your age). D: The heart rate graph shows your heart rate change throughout the exercise session. E: The CALMness graph will show the CALMness score throughout your exercise session. F: The Motion Intensity graph shows the motion intensity recorded through your exercise session. The motion intensity is 1.0 (middle of the graph) when at rest. Jogging will produce relatively small numbers, while jumping will produce larger intensity. Saved sessions can be seen on the app, or in more detail (including the ECG Waveform playback) online at sports.calm-health.com. The primary information from CALM. is your ECG wave, which is the electrical signal from your heart beat. The CALM. 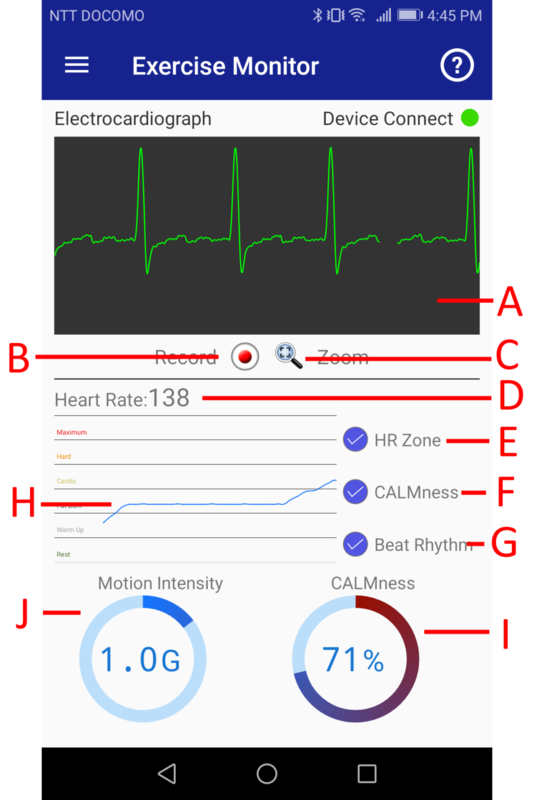 App uses this signal to calculate your heart rate, detect possible irregularities, and other statistics, but to really understand the ECG, you may want to get to know the science better. Here are some good sources of information. The ECG waveform from CALM. has similar features, but is not equivalent to a medical ECG. Many of these principles and techniques are applicable, but it should not be used to diagnose, treat, or prevent diseases. Start by watching this video guide on sleep monitoring. A: The CALM. Device needs to be connected before sleep monitoring can start. Make sure your CALM. device is active, and it may take a few seconds for the connection to be established. If your CALM. device has gone into power save, double tap it to wake it up. 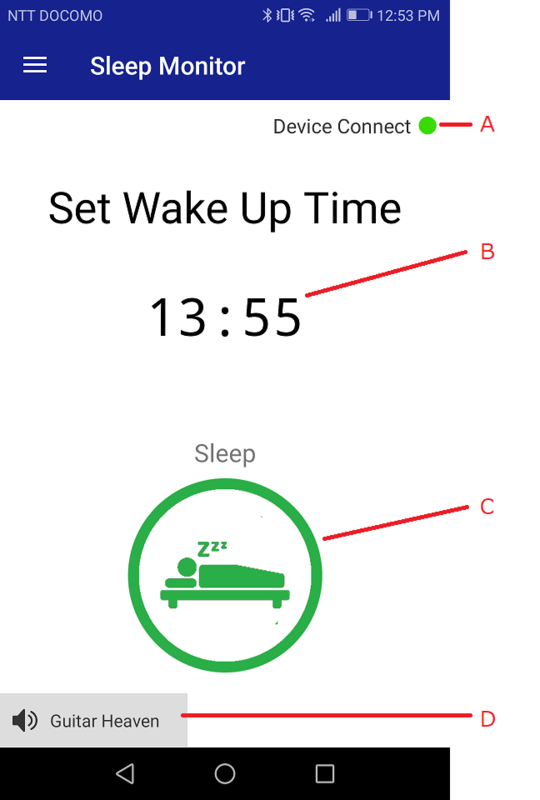 B: Set the wake up time using the time picker. CALM. App’s alarm is separate from your system alarm clock, so if you have one set, both the CALM. App alarm and the system alarm clock will sound. C: The Sleep button starts the sleep analysis. Press this, and set your phone close by and plugged in for the night. Be sure to choose an alarm sound before going to sleep. D: The alarm sound picker. If it is your first time using the app, you should pick an alarm sound from the list. After Sleep analysis is started, you can cancel the analysis or end it early at any time. The data collection will continue for up to 3 minutes after you wake up, to help with sleep quality analysis. The sleep analysis results will be in the data list page, and it may take a few minutes for the whole result to show up. B: Resting heart rate is the lowest heart rate recorded during your sleep. It is one of the indicator of your overall fitness level. Total Sleep Time: it is said that 7~8 hours of sleep is optimal, however, this may differ by individual and by age. Deep Sleep: Measures the amount of deep, restorative sleep as portion of total sleep time. The time you go to bed, and what you do before going to bed (such as taking alcohol, or using smartphone in bed) could affect this. Sleep Onset: Time it takes from going to bed, and falling asleep. This varies with age, but shorter is better. Breathing: Measures if there was any episodes of difficult breathing during sleep. A bad score could be caused by fatigue, unfit pillow, sleep position, or a sleep disorder. 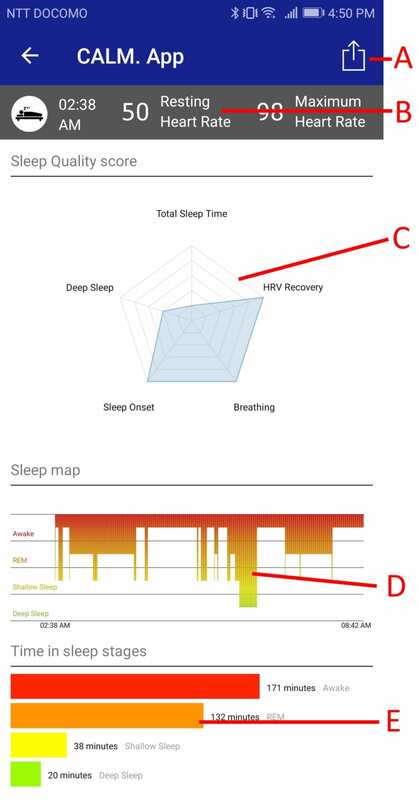 D: Sleep map shows the progression of sleep stages during your sleep, and if you woke up during the night. E: The total time spent in each sleep stage is shown here.